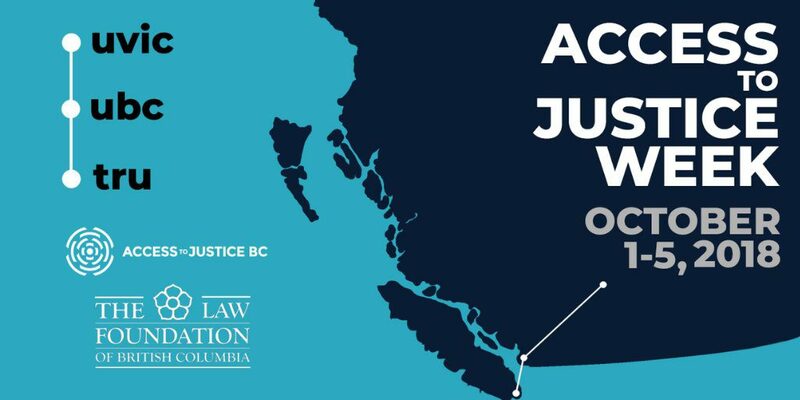 BC’s inaugural Access to Justice Week will take place from October 1 – 5, 2018 with events in Vancouver, Kamloops, and Victoria. The initiative is being led by Allard Law School at the University of British Columbia, Thompson River University Faculty of Law, and the University of Victoria Faculty of Law. While many of the events are for law students, you may be interested in the ones below. Get more information here. Monday, October 1 (8:45 am – 12:05 pm): Innovate BC presents the AI Challenge at the Joseph & Rosalie Segal Centre, Harbour Centre in Vancouver. A half-day event featuring keynotes, panels, and presentations from industry and government leaders. Spend your morning learning how AI innovation is transforming the public and justice sectors and what that means for residents of British Columbia. Admission is free but seats are limited. Get more information and register online here. Nidus presents Personal Planning Month with free presentations and webinars, with viewing available at public host locations throughout BC. As a group – sign up to watch online. Individually – sign up to watch online. Attend at a public host location. See poster or full list at PPM2018. 4 topics, each offered twice on different dates. See the poster with webinars information and registration link here (PDF). Joint ownership – the Good, the Bad & the Risky! In-person presentations, for this topic only, are being held in Vancouver & Burnaby, click for poster PPM2018MetroVan (PDF). Free in-person presentations held in Metro Vancouver: The Planning Continuum — a Will is not enough! See the poster with presentations and registration information here (PDF). Tuesday, October 2 (1:00 – 2:00 pm): the Civil Resolution Tribunal (CRT) presents an information session in Vancouver. On April 1, 2019, the CRT will begin resolving certain motor vehicle personal injury disputes in BC. Community groups are invited to an information session to find out more about how the CRT works and how we’re implementing this new area of jurisdiction. This session will be held at the CRT office in downtown Vancouver. If you are not able to participate in person, please let us know and we will provide you with call-in information. Get more information and register online here. Tuesday, October 2 (5:30 – 7:30 pm): Amici Curiae presents a lecture and a panel as part of Amici Curiae Lecture Series 2018 at the Justice Education Society in downtown Vancouver (also accessible as a webinar). Professor Julie Macfarlane of the University of Windsor will deliver a lecture titled Stepping Up to the Challenge of Access to Justice, followed by a panel What makes A2J BC unique? CPD: 2 hours including 2 hours in client relations, ethics and professional responsibility. Seating is limited. Get more information and register online here. October 2 – 16 (various dates): Seniors First BC presents various workshops in Coquitlam, Port Coquitlam, and Port Moody. Tuesday, October 2 (7:00 – 8:00 pm) Powers of Attorney, Joint Bank Accounts and Representation Agreements Workshop – Port Moody Public Library. Thursday, October 11 (10:00 am – 12:00 pm) Government Benefits for Older Adults Workshop – Dogwood Pavillion, Coquitlam. October 4 – 5: Access Pro Bono BC presents the 7th National Pro Bono Conference in Vancouver. Entitled “Seeing the Need, Taking the Lead,” the 7th National Pro Bono Conference will bring together lawyers, paralegals, law students, judges, politicians, government representatives, non-profit sector leaders, academics and the public from Canada, the US and abroad to share ideas and best practices for increasing access to justice for all members of society. Get more information and register online here. October 4 – 18 (various dates): People’s Law School presents free classes for the public in Burnaby and Port Moody. Wednesday, October 10 (9:30 am – 4:30 pm): Vancouver & District Labour Council presents WCB: Psychological Injuries course in Vancouver. Level: Intermediate/Advanced. There are many kinds of psychological injuries workers may suffer on the job. Some examples are: PTSD for those who witness or are involved in a traumatic event, anxiety, phobias, depression arising from workplace events or from chronic pain from a work-related injury. This course will look at some of the requirements to get a psychological injury accepted by the WCB or on appeal. All courses are held by at the Maritime Labour Centre, 111 Victoria Drive, Vancouver. Course fee for 1-day courses is $70 (members of affiliated unions)/$90 (other). Get more information and the registration form here. October 10 – 19 (various dates): MOSAIC presents various workshops in Burnaby and Surrey. October 15 – 27 (various dates): Plan Institute presents information sessions and workshops by phone/computer and in Vancouver. Monday, October 15 (7:00 – 9:00 pm) Registered Disability Savings Plan (RDSP) – teleseminar by phone/computer. Cost: free. Thursday, October 18 (10:00 – 11:00 am) Wills, Trusts, and Estate Planning Webinar. Cost: free as a limited time offer for BC residents living in rural communities outside of the Lower Mainland. Saturday, October 20 (10:00 am – 12:00 pm) Registered Disability Savings Plan (RDSP) information session – Plan Institute Office, 312 Main Street, Vancouver. Cost: free. Saturday, October 27 (10:00 am – 12:00 pm) Wills, Trusts, and Estate Planning Workshop – Plan Institute Office, 312 Main Street, Vancouver. Cost: $65.00 per person or $90.00 for two. 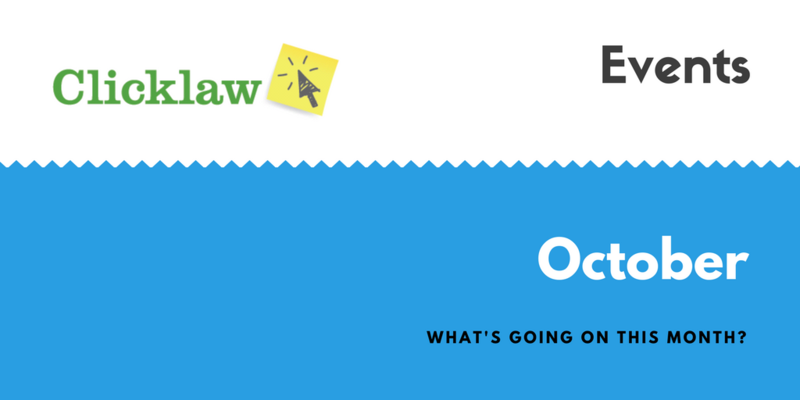 Wednesday, October 17: Law for Nonprofits presents two workshops in Vancouver. 9:30 am – 12:00 pm Employment & Human Rights 101 Workshop – Alliance for Arts + Culture, Vancouver. Cost: $50. City of Vancouver Bursaries available. Get more information and register online here. 1:00 – 3:30 pm The New Societies Act: What You Need to Know – Alliance for Arts + Culture, Vancouver. Cost: $50. City of Vancouver Bursaries available. Get more information here. October 19 – 23 (various dates): UBC Centre for Feminist Legal Studies presents two lectures at the University of British Columbia, Vancouver. Friday, October 19 (12:30 – 1:30 pm) Putting Trials on Trial: Sexual Assault and the Failures of the Legal Profession – Book launch and lecture – Fasken Classroom, Room 122 in Allard Hall, UBC Vancouver. Tuesday, October 23 (12:30 – 1:30 pm) #MeToo and the Boardroom – Fasken Classroom, Room 122 in Allard Hall, UBC Vancouver. October 24 – 30 (various dates): Courthouse Libraries BC presents two free CPD-eligible webinars. Wednesday, October 24 (12:00 – 1:30 pm) Human Rights 201 for Advocates and Service Providers. This 1.5 hour webinar is a follow up to the introductory level course on human rights law offered earlier this year. This course will expand on the topics covered in the Human Rights 101 course and delve deeper into the topic of the duty to accommodate in human rights law. Our presenter, Laura Track is a lawyer and the Director of Education for the Human Rights Clinic at the Community Legal Assistance Society. Participants in this webinar may claim up to 1.5 hour of CPD credit with the LSBC. Get more information and register online here. Tuesday, October 30 (12:30 – 1:30 pm) Civil Resolution Tribunal: New Areas of Jurisdiction. This 1 hour webinar will highlight some of the areas of jurisdiction that will come under the Civil Resolution Tribunal (CRT) starting next year, including some motor vehicle personal injury disputes, and provide you with an inside look at the CRT and Solution Explorer. Our presenter Shannon Salter is the Chair of the CRT. This webinar is suitable for lawyers, advocates and front line workers who may be assisting clients in navigating the CRT or the Solution Explorer. Participants in this session may claim up to 1 hour of CPD credit with the LSBC. Get more information and register online here. Friday, October 26 (3:45 – 6:00 pm): Cerebral Palsy Association of BC presents a workshop Mental Health in the Workplace: Rights and Responsibilities of Youth with Disabilities at the Richmond Centre for Disability, Richmond. This workshop series will address the issues of mental health in the workplace for youth with disabilities. The workshops will be given by two lawyers. Get more information and registration details here.